Strangest food I’ve ever eaten: I think I ate a rat. Tasted like particle board. Me in 12 words or less: The original inspiration for Buckey. 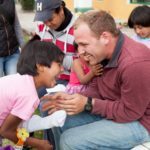 I have three years of experience working with children alongside a non-profit ministry, traveling with them across the United States. My love for spreading the Gospel of Jesus Christ has taken me around the world, to places like Russia, Colombia and Ecuador. I worked for nearly two years as purchasing agent in Chicago, then on the sales and marketing team for a higher education company in San Antonio, TX. My passion is seeing America returned to its founding principles. I am avidly involved in and pursuing opportunities that will influence the political process. I formerly worked as Director of Communications for a State Representative in the Texas State House. Currently I serve as the chief of staff for a Texas Representative. I love to travel across the US but there is something special about leaving the, “comfort zone” of your country and traveling to another where you do not speak the language. My perspective on international ministry is directly linked to my perspective on personal, everyday life. Life as a believer in Jesus Christ means ministry. No matter where I am, no matter what I am doing, if I am unable to communicate Christ’s love to those I spend every day with, then how can I expect to share Him with the world? Our lives as believers in Jesus Christ, as men and women who have been transformed by His grace, should be a testimony of it first to those who know us best. When Jesus told His disciples to “Go unto all the world” He was telling them to leave the very country that many travel to today to share His name. Your international ministry began when you trusted Jesus for salvation and wherever you go it’s right there with you.